Most often, babies are saddled with the oldies from their parents’ childhoods. And while this is a nice gesture, some of those knickknacks are out-of-date and lack educational value to enhance a miniature youngster’s explorative mind. From the ages of 6 months and up, kiddos’ minds are developing at a rapid rate and they’re constantly curious. With this in mind, parents need to hunt down the bargains that will teach and outlast childhoods. 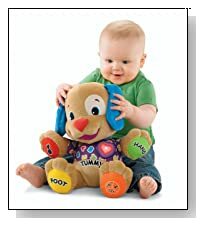 From a short-list of top 10 toys for babies, I’ve pulled 3 of the very best, most educational, and amusing gadgets that will keep your cutie giggling, cooing, and learning for his or her first few years of life. One lump of sugar or two? This adorable tea-set shows kids the power of manners! 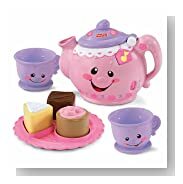 Teaching children the importance of "please" and "thank you" from a young age, this set includes a happy teapot and her teacup friends. All of them are cutesy and cool with smiling faces and pleasant, expressive demeanors that convey nothing but the utmost happiness. Mesmerizing and super-cute, the Winkel was originally designed to be a teething toy for toddlers of teething age. 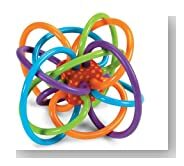 However, the designs and interwoven tubes are durable for playtime and provide hours of on-the-go entertainment. Kids can twist and turn the Winkels this way and that, admiring the vibrant colors and sleek make of each weave of soft, plastic looping. It’s a maze of continuous tubes! At the center is an immobile block of red and orange polka-dots that captures each woven loop and releases it softly at the other side. 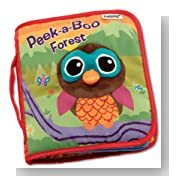 Absolutely everything is adorable and educational when it comes to this soft, crinkly book of peek-a-boo flaps and intriguing stories. There are numerous titles – such as the Peek-a-boo Forest, Captain Calamari’s Treasure Hunt, Panda’s Pals – and so many more. Babies can develop a love for animals while exploring the mysteries of a deep, blue sea, or gathering treasures with an enticing octopus. Or they can get to know a Panda Bear and all his animal friends. And perhaps, they could even venture into a deep, eerie forest along with a friendly owl to discover that there’s really nothing to be afraid of. Each book is beautiful with explorative illustrations and stimulating colors! When children are newborns, they receive dozens of gifts from family, friends, and well-wishers of all ages and child-caring experience levels. However, parents are the ones that must make the better decisions when it comes to what their babies will play with. After all, pre-toddler playthings are an essential part of a baby’s development. With this, and the fact that so many babies have been born this year, in mind, I’ve comprised a top-3 of the very best baby toys 2014. It’s no surprise that all of these knickknacks are from Fisher-Price, and each one is designed to encourage your baby’s mental, physical, and emotional health. 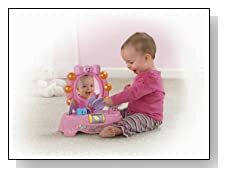 The Fisher-Price version of a tried-and-true classic is no ordinary mirror! Comprised of the safest, shiniest plastic, this magical, musical mirror has 2 modes of learning, melodious playtime. There are makeup items attached to the vanity’s surface, teaching babies the difference between unique textures, colors, and numbers. They can sort compact objects while listening to sing-along songs that are instant favorites amidst harmonious listeners. Included are a comb, powder puff, lipstick case, and 2 wearable bracelets! Your miniature sweetheart will also adore her clear-as-crystal reflection in an allover pink setting. This adorable pup has been around for quite some time, and its reign of soaring popularity will increase in 2014. Expected to hit record-numbers and satisfaction ratings, this cutesy canine teaches kids their ABCs, 123s, and simple anatomy with sing-along songs and over 10 classic games. The puppy’s collar is shaped like a heart, lighting up in time to the beat of every song. Plus, there are notes on each part of the doggy’s body, such as hand and foot, providing kids with sight-words as well as the name for those designated bodily pieces. We’ve all seen these before, but somehow Fisher-Price does it better in 2014! There are 10 colorful blocks that are easy to grasp and handle, and a lid with 5 different shapely cutouts. 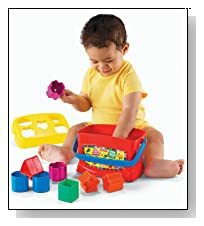 Babies can work on their identification and sorting skills by sliding each block into the designated holes, then pouring them all out to start again. The pieces are chunky, durable, and designed to outlast anything a toddler could possibly do – such as teething and the everyday wear-and-tear of childhood.